WIndows phone was a rather constricted OS when it launched some time ago. Till it’s WP8 update, it was buggy beyond repair. With no support for high resolution screens and Quad-core processors, it was always in the spotlight for ‘missing‘ something. To counter this, Microsoft set up a feature suggestion program where u suggest improvements to the OS. An administrator replied to a suggestion by a member on the UserVoice website. The suggestion was “Add File Manager To Windows Phone“, an admin then closed the thread while replying in the affirmative, “This feature is now available in Windows Phone 8.Windows Phone will receive a good boos in productivity by this step since it’s App store does not have good and capable file managers. Among other features that may be coming to Windows phone 8 are swiping the screen from top to bottom to close applications and storing App’s and related data on micro SD card. These features are quite common in Android and Windows 8, however it seems the next update will make these available to WP also. 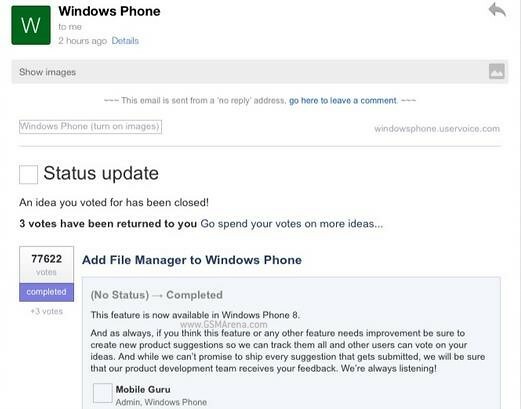 This will be like the best news ever for Windows Phone users, the feature suggestion program seems to be working out good.Windows Phone now needs diversified manufacturers and refined apps, even some of the essential apps on the app store are buggy.